Solar reflective "cool" pavements stay cooler in the sun than traditional pavements. Pavement reflectance can be enhanced by using reflective aggregate, a reflective or clear binder, or a reflective surface coating. Energy savings and emission reductions. Cool pavements lower the outside air temperature, allowing air conditioners to cool buildings with less energy. Cool pavements also save energy by reducing the need for electric street lighting at night. Improved comfort and health. Cool pavements cool the city air, reducing heat-related illnesses, slowing the formation of smog, and making it more comfortable to be outside. Pedestrians also benefit from cooler air and cooler pavements. Increased driver safety. 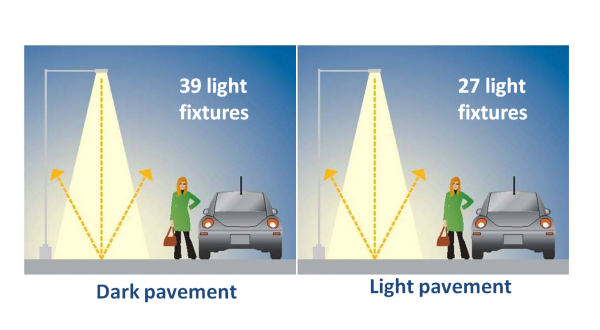 Light-colored pavements better reflect street lights and vehicle headlights at night, increasing visibility for drivers. Improved air quality. By decreasing urban air temperatures, cool pavements can slow atmospheric chemical reactions that create smog. Reduced street lighting cost. Cool pavements can increase the solar reflectance of roads, reducing the electricity required for street lighting at night. Reduced power plant emissions. By saving energy on street lighting and A/C use in surrounding buildings, cool pavements reduce the emission of greenhouse gases and other air pollutants at power plants. Slowed climate change. 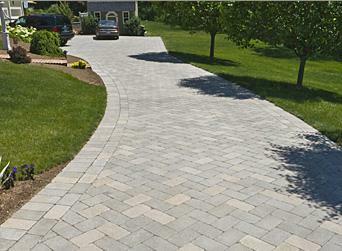 Cool pavements decrease heat absorbed at the Earth’s surface and thus can lower surface temperatures. This decrease in surface temperatures can temporarily offset warming caused by greenhouse gases. 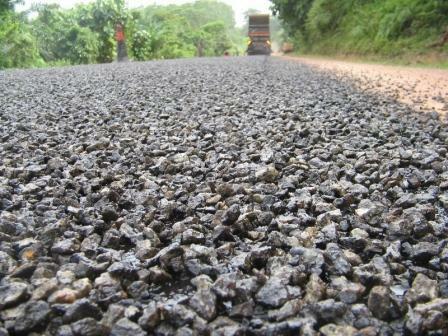 Cool pavement materials usually require more energy and carbon to manufacture than conventional pavement materials. An exception is concrete with substantially reduced levels of energy- and carbon-intensive ordinary portland cement. Raising by 0.20 the albedo of all paved surfaces is projected to reduce summertime outdoor air temperatures in California cities by about 0.1 to 0.5 °C (about 0.2 to 0.9 °F), depending on city geography and climate. In California cities with a lot of air conditioning, the savings of air conditioning energy due to lowered air temperature is less than 1 kWh (saving less than US$0.60) a year per m² of pavement modified. The avoided CO₂ is valued at less than a penny a year per m². The energy and carbon saved in buildings is typically much less than the extra energy and carbon needed to make the cooler pavements. For comparison, building energy savings from cool pavements are about an order of magnitude smaller than those from cool roofs. Reflective pavements offer a one-time carbon offset (benefit) that exceeds the 50-year life-cycle carbon penalty (or 50-year life-cycle carbon savings). An important challenge is to create cool pavement materials that reduce life-cycle energy, carbon, and cost. Cool pavements can be made from traditional paving materials, such as cement concrete. New cement concrete has a solar reflectance (SR) of 30–50%. There are also novel cool-colored coatings for asphalt concrete pavements that reflect about 50% of sunlight. Another approach is to use a clear binder that reveals highly reflective (light-colored) aggregate. 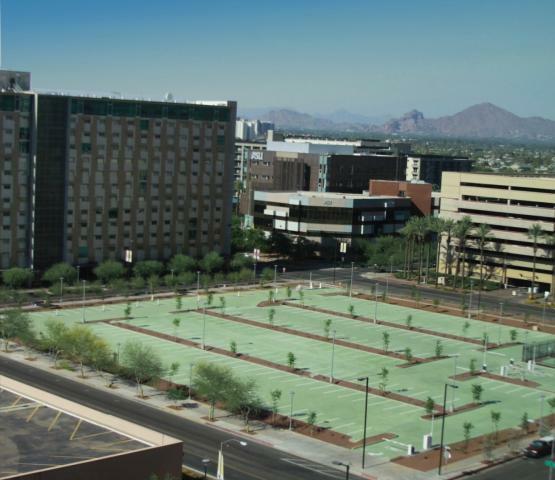 As with all materials exposed to the atmosphere and use, the solar reflectance of pavement can change over time. For example, as cement concrete pavement ages it tends to get darker with tire and grease stains (new SR 30-50%; aged SR 20-35%), but asphalt concrete lightens (new SR 5%; aged SR 10-20%) as it ages because the asphalt binder oxidizes and more aggregate is exposed through wear. 4 Akbari H, Rose LS, Taha H. 1999. Characterizing the fabric of the urban environment: A case study of Sacramento, California. Lawrence Berkeley National Laboratory. 6 Pratt C, Mantle J, Schofield PA. 1995. 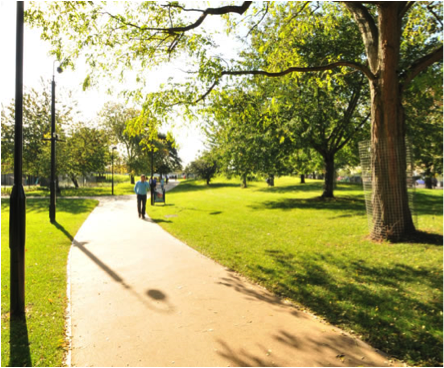 UK research into the performance of permeable pave­ment, reservoir structures in controlling stormwater discharge quantity and quality. Water Science and Tech­nology 32(1): 63-69. 7 James W and Shahin R. 1998. Pollutants leached from pavements by acid rain. In W. James (ed. ), Advances in Modeling the Management of Stormwater Impacts. Vol. 6: 321-349. Guelph, Canada: Computational Hydraulics Int. 8 Levinson, Ronnen M., Haley E. Gilbert, Melvin Pomerantz, John T. Harvey, and George A. Ban-Weiss. Recent cool pavement research highlights: Quantifying the energy and environmental consequences of cool pavements., 2017. Levinson, Ronnen M, and Hashem Akbari. "Effects of composition and exposure on the solar reflectance of portland cement concrete." Cement and Concrete Research 32 (2002) 1679-1698. Pomerantz, Melvin, Hashem Akbari, and John T Harvey. "Cooler reflective pavements give benefits beyond energy savings: durability and illumination." ACEEE 2000 Summer Study on Energy Efficiency in Buildings 2000: 293-304. LBNL-45370. Bretz, Sarah E, Hashem Akbari, and Arthur H Rosenfeld. "Practical issues for using solar-reflective materials to mitigate urban heat islands." Atmospheric Environment 32 (1998) 95-101. Pomerantz, Melvin, Hashem Akbari, Allan Chen, Haider Taha, and Arthur H Rosenfeld. Paving materials for heat island mitigation. 1997. Akbari, Hashem, Arthur H Rosenfeld, and Haider Taha. "Cool construction materials offer energy savings and help reduce smog." ASTM Standardization News 23 (1995) 32-37.